Stay cool and creative all summer long by participating in Camp NaNoWriMo's July session—either online here or over at Camp NaNoWriMo (if you're 13 or older), or offline by using our writer-friendly, print-out-able Summer Writing Program resources. Choose a project you care about, set an ambitious goal, get feedback on your progress, and receive support from an international community of fellow writers. Warning: chance of creativity very high! 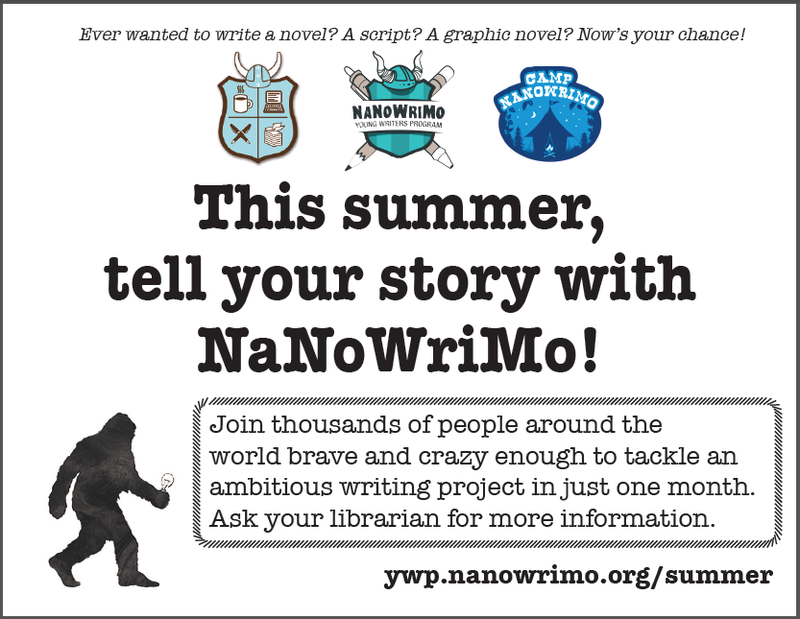 Download NaNoWriMo's Summer Writing Program resources! Are you an adult who wants to facilitate? Look for the facilitator resources link below! Now: Declare your wild and fantastic writing project. Also Now: Set a challenging-but-realistic goal for how many words, pages, or hours you want to write in July. June: Plan out your project, but don’t start writing yet! If you need help, ask a librarian or other adult for advice. Check out the Young Novelist Workbooks and visit the YWP Camp NaNoWriMo forums to chat with other young writers. July: Lock up your Evil Inner Editor and write, write, write! Track your progress every day, and color in your chart to see how far you’ve come. August: Whether you reach your goal or not, it’s time to celebrate! Ask a librarian or other adult for revising help and publishing ideas. You did it! Under 18? You can accept the Camp NaNoWriMo challenge from your YWP Dashboard in June, then write in our youth-friendly writing space in July. 13 or older? You have the option of signing up for a Camp NaNoWriMo account as well, where you'll be able to participate as part of a private or public online cabin with other writers. Are you an adult who wants to facilitate NaNo's Summer Writing Program? Spend your summer guiding young writers to craft the novels, comic books, and scripts of their dreams (not to mention epic poems and letters to a future self). Our facilitator resources include a flyer, a group progress chart, and writer/winner certificates, in addition to all the materials for young writers. 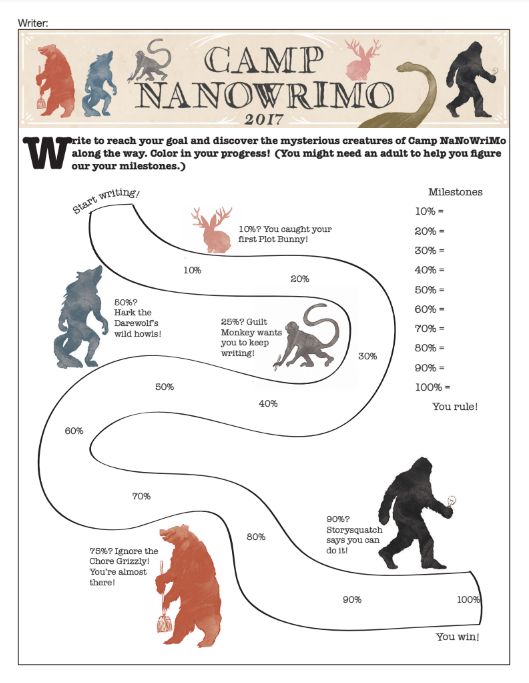 Check out the NaNoWriMo blog. Subscribe to NaNoWriMo on YouTube for regular writing tips, inspiration, and community. Follow NaNoWriMo on Instagram, Twitter, or Facebook for updates.